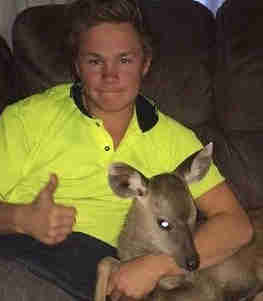 Last month, a young farmhand named Andrew Foots was on his way to a party when he spotted a baby deer lying in the grass alone. Wisely thinking the mother was nearby - mother deer often leave their babies when they're out feeding - Foots continued on his way. But the next day, the deer was still there, and looked "weak and skinny," Pam Ahern, founder of Edgar's Mission Farm Sanctuary, told The Dodo. Knowing that the fawn faced certain death in the Australian wild, Foots decided to help. 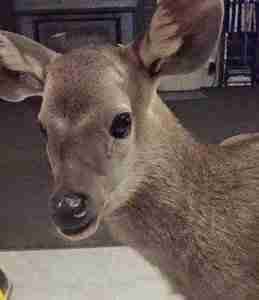 "As any kind heart would, Andy took pity on the vulnerable animal and took him home, contacting the vet to find out what formula to feed and also check if it was OK to raise the deer," Ahern said. "Forming a strong bond with the animal, he was named Rudolph and the two became inseparable." For the next week or so, Foots tended to the 4-week-old fawn carefully, feeding him every three hours and growing increasingly protective of the orphaned animal. That all ended when officials with Australia's Department of Economic Development, Jobs, Transport and Resources (DEDJTR) showed up on Foots' doorstep. "The game officers came about a week later and seized the animal stating it was illegal to take animals from the wild and that he would face heavy charges and the deer would be killed," Ahern said. Rudolph was whisked away to his death, and Foots jumped into action. He contacted Edgar's Mission, a sanctuary for abused and abandoned farm animals, to see if they could help. "Despite being legally allowed to kill the animals the gaming officers sought a court order to kill the animal," Ahern explained. "This actually gave a window of opportunity to intervene." Yet when Ahern reached out and offered to take in the deer, on behalf of Jirrahlinga Koala and Wildlife Sanctuary, she received an odd answer. "They advised I could do that, but they would still go through with the court case and still call for the deer to be killed," she said. "I questioned why they would do that when it would cost them nothing and it would be seen as an act of goodwill to allow the animal to live out his days in peace," Ahern said. "I further added there would be a great public benefit for the deer going to the sanctuary in that people would get to see this rarely seen animal and learn about them." Yet the DEDJTR, for whatever reason, was determined to kill the infant deer. On Friday, the department won a court order allowing it to execute the young animal, arguing that Rudolph was a threat to public safety. Now, Ahern and Foots - and their growing team of supporters - are fighting to save the innocent fawn from certain death. While it's generally inadvisable for members of the untrained public to interact with wildlife, there have been cases where kind individuals have stepped in where no other help was available to lend a helping hand. In many cases, when officials find out, they will try to kill the animal and bring charges against the rescuers. But what's so strange here is that a sanctuary has stepped up to rehome the young deer - yet wildlife officials are set on death. "I find it incongruous that despite this safe haven being offered and the public benefit that would follow from the deer going to Jirrahlinga, Magistrate Hawkins has signed off on the killing of Rudolph," Ahern wrote in a plea to Edgar's Mission's fans on Facebook. "Not only will this hapless animal become a pawn in a bigger picture but also taxpayers will have to pay the bill for this circus. No one is going to win." In a Change.org petition he started, Foots described the situation as "crazy." "I'm facing charges," he wrote. "He needs our help!" Rudolph is currently being kept in a secret location by the DEDJTR until Foots' appeal on February 18. Ahern and Foots are hoping public pressure can help replace the confusing decision with one of mercy. "I am bitterly disappointed in the poor message this sends to the community in regards to caring for other beings," Ahern wrote. "Surely in such troubled times we should be promoting the compassionate actions of Andrew Foots, not killing them and baby deer." If you'd like to help, you can sign the petition calling for Rudolph's release or donate to the legal fund. You can also email the Australian officials below asking for them to send Rudolph to Jirrahlinga Koala and Wildlife Sanctuary instead of killing him. Email: jaala.pulford@parliament.vic.gov.au As Edgar's Mission wrote, "It is not too late for Rudolph to have a kind Christmas."